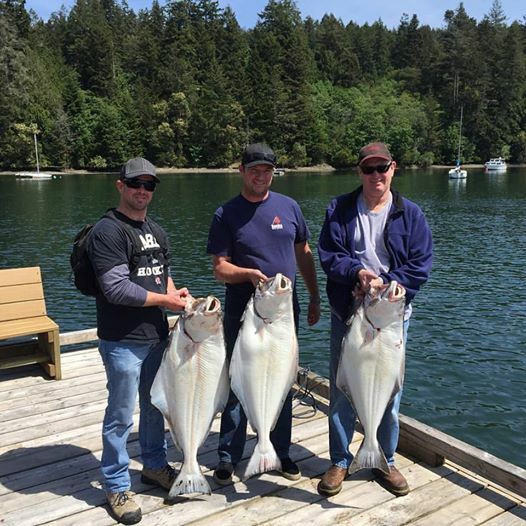 Sooke's early season fishing has been excellent. Most of the local anglers are targeting halibut, and they are coming in regularly from the east, from the west, and right in front of Sooke Harbour. There are also some nice salmon being taken, with one report up to 26 pounds out west of Sheringham Point. Beautiful sunny weather with no fog, this is a nice time of year to fish -- just watch for those afternoon west winds. Picture is guests of Vancouver Island Lodge after a fun day on the water. About to have a halibut and crab feast ... the days are great, the evenings even better. The good life!